CD8+ T cells dominate the lymphocyte population insynovial fluid in chronic inflammatory arthritis. It is known that theseCD8+ T cells are often clonally or oligoclonally expanded, but theirspecificity and their relevance to the pathogenesis of joint disease hasremained unclear. We found that as many as 15.5% of synovial CD8+ Tcells may be specific for a single epitope from an Epstein-Barr virus lyticcycle protein. The virus-specific T cells within the joint showed increasedexpression of markers of activation and differentiation compared with those inthe periphery, and retained their functional capacity to secreteproinflammatory cytokines on stimulation. These activated, virus-specificCD8+ T cells could therefore interact with synoviocytes, either bycell-cell contact or by a cytokine network, and play a 'bystander'role in the maintenance of inflammation in patients with arthritis. Epstein-Barr virus (EBV) is transmitted orally, replicates in theoropharynx and establishes life-long latency in human B lymphocytes. T-cellresponses to latent and lytic/replicative cycle proteins are readily detectablein peripheral blood from healthy EBV-seropositive individuals. EBV has alsobeen detected within synovial tissue, and T-cell responses to EBV lyticproteins have been reported in synovial fluid from a patient with rheumatoidarthritis (RA). This raises the question regarding whether T cells specific forcertain viruses might be present at high frequencies within synovial fluid andwhether such T cells might be activated or able to secrete cytokines. If so,they might play a 'bystander' role in the pathogenesis ofinflammatory joint disease. To quantify and characterize T cells that are specific forepitopes from EBV, cytomegalovirus (CMV) and influenza in peripheral blood andsynovial fluid from patients with arthritis. Peripheral blood mononuclear cells (PBMCs) and synovial fluidmononuclear cells (SFMCs) were obtained from patients with inflammatoryarthritis (including those with RA, osteoarthritis, psoriatic arthritis andreactive arthritis). Samples from human leucocyte antigen (HLA)-A2-positivedonors were stained with fluorescent-labelled tetramers of HLA-A2 complexedwith the GLCTLVAML peptide epitope from the EBV lytic cycle protein BMLF1, theGILGFVFTL peptide epitope from the influenza A matrix protein, or the NLVPMVATVepitope from the CMV pp65 protein. Samples from HLA-B8-positive donors werestained with fluorescent-labelled tetramers of HLA-B8 complexed with theRAKFKQLL peptide epitope from the EBV lytic protein BZLF1 or the FLRGRAYGLpeptide epitope from the EBV latent protein EBNA3A. All samples were costainedwith an antibody specific for CD8. CD4+ T cells were not analyzed.Selected samples were costained with antibodies specific for cell-surfaceglycoproteins, in order to determine the phenotype of the T cells within thejoint and the periphery. Functional assays to detect release of IFN-γ ortumour necrosis factor (TNF)-α were also performed on some samples. The first group of 15 patients included 10 patients with RA, onepatient with reactive arthritis, one patient with psoriatic arthritis and threepatients with osteoarthritis. Of these, 11 were HLA-A2 positive and five wereHLA-B8 positive. We used HLA-peptide tetrameric complexes to analyze thefrequency of EBV-specific T cells in PBMCs and SFMCs (Figs 1 and 2). Clear enrichment ofCD8+ T cells specific for epitopes from the EBV lytic cycle proteinswas seen within synovial fluid from almost all donors studied, includingpatients with psoriatic arthritis and osteoarthritis and those with RA. Indonor RhA6, 9.5% of CD8+ SFMCs were specific for the HLA-A2restricted GLCTLVAML epitope, compared with 0.5% of CD8+ PBMCs.Likewise in a donor with osteoarthritis (NR4), 15.5% of CD8+ SFMCswere specific for the HLA-B8-restricted RAKFKQLL epitope, compared with 0.4% ofCD8+ PBMCs. In contrast, we did not find enrichment of T cellsspecific for the HLA-B8-restricted FLRGRAYGL epitope (from the latent proteinEBNA3A) within SFMCs compared with PBMCs in any donors. In selected individualswe performed ELISpot assays to detect IFN-γ secreted by SFMCs and PBMCsafter a short incubation in vitro with peptide epitopes from EBV lyticproteins. These assays confirmed enrichment of T cells specific for epitopesfrom EBV lytic proteins within synovial fluid and showed that subpopulations ofthese cells were able to secrete proinflammatory cytokines after short-termstimulation. We used a HLA-A2/GILGFVFTL tetramer to stain PBMCs and SFMCs fromsix HLA-A2-positive patients. The proportion of T cells specific for thisinfluenza epitope was low (<0.2%) in all donors studied, and we did not findany enrichment within SFMCs. We had access to SFMCs only from a second group of fourHLA-A2-positive patients with RA. A tetramer of HLA-A2 complexed to theNLVPMVATV epitope from the CMV pp65 protein reacted with subpopulations ofCD8+ SFMCs in all four donors, with frequencies of 0.2, 0.5, 2.3 and13.9%. SFMCs from all four donors secreted TNF after short-term incubation withCOS cells transfected with HLA-A2 and pp65 complementary DNA. We analyzed thephenotype of virus-specific cells within PBMCs and SFMCs in three donors. TheSFMC virus-specific T cells were more highly activated than those in PBMCs, asevidenced by expression of high levels of CD69 and HLA-DR. A greater proportionof SFMCs were CD38+, CD62L low, CD45RO bright, CD45RA dim,CD57+ and CD28- when compared with PBMCs. This work shows that T cells specific for certain epitopes fromviral proteins are present at very high frequencies (up to 15.5% ofCD8+ T cells) within SFMCs taken from patients with inflammatoryjoint disease. This enrichment does not reflect a generalized enrichment forthe 'memory pool' of T cells; we did not find enrichment of T cellsspecific for the GILGFVFTL epitope from influenza A or for the FLRGRAYGL epitopefrom the EBV latent protein EBNA3A, whereas we found clear enrichment of Tcells specific for the GLCTLVAML epitope from the EBV lytic protein BMLF1 andfor the RAKFKQLL epitope from the EBV lytic protein BZLF1. The enrichment might reflect preferential recruitment ofsubpopulations of virus-specific T cells, perhaps based on expression ofselectins, chemokine receptors or integrins. Alternatively, T cells specificfor certain viral epitopes may be stimulated to proliferate within the joint,by viral antigens themselves or by cross-reactive self-antigens. Finally, it istheoretically possible that subpopulations of T cells within the joint arepreferentially protected from apoptotic cell death. Whatever the explanation,the virus-specific T cells are present at high frequency, are activated and areable to secrete proinflammatory cytokines. They could potentially interact withsynoviocytes and contribute to the maintenance of inflammation within joints inmany different forms of inflammatory arthritis. Staining of paired samples of peripheral blood and synovial fluidwith human leucocyte antigen (HLA)-peptide tetrameric complexes. Paired samplesof peripheral blood mononuclear cells (PBMCs; left column) and synovial fluidmononuclear cells (SFMCs; right column) from donors (a) RhA6, (b,c) RhA5 and (d) RhA7 were stained with a monoclonal antibody thatwas specific for CD8 and with (a, b) the A2/GLCTLVAML tetramer or (c,d) the B8/RAKFKQLL tetramer. The percentage frequency of CD8+ Tcells that reacted with the tetrameric complexes is shown; 50 000 live cellswere included in the analysis. T cells specific for the Epstein-Barr virus (EBV) lytic proteinepitopes GLCTLVAML and RAKFKQLL are enriched within synovial fluid. Pairedsamples of peripheral blood mononuclear cells (PBMCs) and synovial fluidmononuclear cells (SFMCs) were stained with (a) the A2/GLCTLVAMLtetramer or (b) the B8/RAKFKQLL tetramer together with a monoclonalantibodies specific for CD8. The percentage of CD8+ T cells thatreact with the relevant tetrameric complex is shown. L, left knee; R, rightknee. Epstein-Barr virus (EBV) is a common gammaherpesvirus that infects over 90% of individuals worldwide . The virus is transmitted orally, replicates in the oropharynx and subsequently establishes life-long latent infection of B lymphocytes . Replicative infection is associated with the expression of approximately 70EBV 'lytic' proteins, whereas latent infection is associated with the expression of up to nine 'latent' proteins [3,4]. The cellular immune response plays a crucial role in controlling EBV infection. T-cell responses to EBV latent proteins have been well studied and are easily detectable in healthy EBV-seropositive individuals [5,6,7]. More recently, responses to some of the EBV lytic cycle proteins have also been described [7,8,9,10]; reactivities to these antigens are frequently found to be more abundant than those directed against the EBV latent antigens in healthy EBV carriers [7,9,10]. An association between EBV and rheumatoid arthritis (RA) was first proposed on the basis of high titres of EBV-specific antibodies found in some patients with RA [11,12]. The observation that some of the anti-EBV antibodies were cross-reactive with autoantigens such as collagen was put forward as a further argument in support of the link . The importance of these findings in the pathophysiology of rheumatoid arthritis has never been established, however. More recently the cloning of T cells that are specific for EBV antigens from synovial fluid taken from a patient with RA  has reopened the debate regarding the importance of this virus in the aetiology of arthritis. David-Ameline et al  showed that a large proportion of T-cell clones derived from synovial fluid taken from one individual with RA, under polyclonal activation conditions, recognized EBV-transformed lymphoblastoid cell lines in an human leucocyte antigen (HLA)-restricted manner. Subsequent work revealed that these T-cell clones recognized epitopes from EBV lytic cycle proteins . Analysis of the T-cell receptor use of the EBV-specific T cell clones and of the T-cell receptor repertoire of synovial fluid lymphocytes [14,15] suggested that the EBV-specific T cells were clonally expanded within the synovial fluid from this donor. In some other donors, short-term T-cell lines derived from synovial fluid lymphocytes, but not those derived from peripheral blood lymphocytes, secreted low levels of tumour necrosis factor (TNF) in response to stimulation with an EBV antigen [14,16]. These results suggested that EBV-specific T cells might form a component of joint infiltrating lymphocytes in patients with RA. In the present study we used tetrameric HLA-peptide complexes  to investigate the T-cell response to EBV, cytomegalovirus (CMV) and influenza in individuals with inflammatory arthritis. We made tetramers of HLA molecules complexed to peptide epitopes from EBV latent and lytic proteins [7,10], to an epitope from a CMV structural protein  and to an epitope from influenza A matrix protein . We used these tetramers to quantify and characterize virus-specific CD8+ T cells within samples of peripheral blood and synovial fluid taken from patients with inflammatory arthritis. The experiments show that CD8+ T cells specific for certain viral antigens are enriched within synovial fluid. The enrichment could reflect recruitment into, stimulation within or preferential survival within inflamed joints. The virus-specific T cells are activated and subpopulations are able to secrete proinflammatory cytokines. These T cells could therefore interact with synoviocytes and play a role in the maintenance of inflammation in chronic arthritis. Samples of synovial fluid and peripheral venous blood were initiallyobtained from a group of 15 EBV-seropositive patients, 13 of whom were HLA-A2positive and/or HLA-B8 positive. Ten patients (RhA1-RhA10) suffered from RA,one from reactive arthritis (NR1), one from psoriatic arthritis (NR2) and threefrom osteoarthritis (NR3-NR5). Details of these patients are given in Table1. Peripheral blood mononuclear cells (PBMCs) andsynovial fluid mononuclear cells (SFMCs) were isolated using Lymphoprep(Nycomed Pharma, Oslo, Norway) gradient centrifugation and cryopreserved in 10%dimethyl sulphoxide, 90% fetal calf syndrome at -70°C. Only synoviallymphocytes were available for analysis from a smaller second group ofHLA-A2-positive RA patients (RA3, RA11, RA14 and RA15), whose clinical statushas been described elsewhere . The HLA-B type of patient RhA6 and the HLA-A type of patient NR5Were not determined. Genomic DNA was extracted from whole blood using a Puregene kit(Gentra systems, Minneapolis, MN, USA) according to the manufacturer'sinstructions. Each patient was tissue typed using polymerase chain reaction, aspreviously described . HLA-A and HLA-B types aresummarized in Table 1. HLA-peptide tetramers were produced as previously described [7,10]. Briefly, recombinant class Iheavy chain or β2-microglobulin was produced in Escherichiacoli cells transformed with the relevant expression plasmids. Expressionof the heavy chain was limited to the extracellular domain and the sequence ofthis domain was modified by the addition of a substrate sequence for BirAbiotinylation at the carboxyl terminus. The HLA-peptide complexes were foldedin vitro using 30mg heavy chain, 25mg β2-microglobulinand 10mg peptide, then biotinylated using purified BirA enzyme (Avidity,Denvery, CO, USA). The biotinylated complexes were recovered by fastperformance liquid chromatography (FPLC) purification and ion exchangechromatography. Tetramers were made by mixing biotinylated protein complex withstreptavidin-phycoerythrin (PE) at a molar ratio of 4:1. The three HLA-A2tetrameric complexes synthesized for this study contained either the influenzaA virus matrix peptide GILGFVFTL  (A2/FluMtetramer), the EBV BMLF1 peptide GLCTLVAML [9,14] (A2/GLC tetramer), or the CMV pp65 peptide NLVPMVATV (A2/NLV tetramer). Two HLA-B8 tetramers were alsomade, with the EBV EBNA3A peptide FLRGRAYGL  (B8/FLRtetramer), or the EBV BZLF1 peptide RAKFKQLL [8,9] (B8/RAK tetramer). This assay was used to detect IFN-γ production by T cells infresh samples of PBMCs and SFMCs on antigen stimulation. Ninety-six-wellpolyvinylidene difluoride backed plates (Millipore, Watford, UK) were precoatedwith 15 μ g/ml of anti-IFN-γ monoclonal antibody 1-DIK(Mabtech,Stockholm, Sweden). PBMCs were added in duplicate wells at2.5×105, 1.25×105 and 6.25×104cells/well and incubated overnight at 37°C, 5% carbon dioxide with theexact 8-mer or 9-mer peptide antigen(2 μ mol/l final concentration). Thecells were discarded the following day and the second biotinylatedanti-IFN-γ mono-clonal antibody, 7-B6-1 biotin (Mabtech, Stockholm,Sweden), was added at 1 μ g/ml and left for 3h at room temperature,followed by streptavidin-conjugated alkaline phosphatase (Mabtech, Stockholm,Sweden) for a further 2h. Individual cytokine-producing cells were detected asdark spots after a 30-min reaction with 5-bromo-4-chloro-3-indolyl phosphateand nitroblue tetrazolium using a pre-mixed alkaline phosphatase conjugatesubstrate kit (Bio-Rad, Richmond, CA, USA). The spots were counted under adissection microscope. The number of specific responders was calculated aftersubtracting negative control values. COS cells were transfected with HLA-A2 and pp65 complementary DNA aspreviously described . CD8+ SFMCs(104 and 105) were incubated with the transfected COScells for 6h. The culture supernatant was harvested and tested for TNF-αcontent by measuring culture supernatant cytotoxicity against Wehi 164 clone 13in a colorimetric assay as previously described . PBMCs were incubated for 30min in phosphate-buffered saline with0.16% bovine serum albumin and 0.1% sodium azide, containing 0.5mg/mlphycoerythrin-labelled tetrameric complex, washed and then stained on ice withsaturating amounts of an anti-CD8 monoclonal antibody directly conjugated toTricolor (Caltag Laboratories, San Francisco, CA, USA). For phenotypicanalysis, selected samples were also incubated with one of a panel ofmono-clonal antibodies directed against cell-surface markers. This panelconsisted of anti-CD28 fluorescein isothiocyanate (FITC) (Immunotech,Marseilles, France), anti-CD45RA FITC (Immunotech, Marseilles, France),anti-CD45RO FITC (DAKO, Glostrup, Denmark), anti-CD57 FITC (Becton-Dickinson,Mountain View, CA, USA), anti-CD62L FITC (Pharmingen, San Diego, CA, USA),anti-CD69 FITC (DAKO) and anti-HLA DR FITC (DAKO). All samples were fixed in 2% formaldehyde and analyzed using afluorescent antibody cell sorter using CELLQuest software (Becton-Dickinson).For two-colour analysis 50000 live cells were analyzed. For three-colouranalysis 200000 live cells were analyzed. In each experiment the lymphocytepool was identified using forward and side scatter analysis and markers wereset to analyze the CD8hi subset of CD3+ T cells.CD4+ T-cell responses were not analyzed in the present study. In the first group of patients we used HLA-peptide tetramericcomplexes to analyze the frequency of CD8+ T cells specific for twoEBV lytic protein epitopes, the HLA-A2 restricted epitope (GLCTLVAML) fromBMLF1 [9,14] and the HLA-B8restricted epitope (RAKFKQLL) from BZLF1 [8,9], and for an EBV latent protein epitope, the HLA-B8restricted epitope (FLRGRAYGL) from EBNA3A . We initially studied 11 HLA-A2+ patients withinflammatory arthritis. In patient RhA6, 9.5% of CD8+ T cells withinsynovial fluid were specific for the GLCTLVAML epitope from BMLF1, whereas only0.5% CD8+ T cells within peripheral blood were specific for thisepitope (Figs 1a and 2a). Likewisein patient RhA5, T cells that were specific for the GLCTLVAML epitope wereclearly enriched within synovial fluid (4.5% of CD8+ T cells) whencompared with peripheral blood (1.0%; Figs 1b and2a). In four of the six other HLA-A2+individuals with RA (RhA2, RhA3, RhA8, RhA9), we also found higher frequenciesof T cells specific for GLCTLVAML in synovial fluid than in peripheral blood(Fig. 2a). This finding was not restricted to patientswith RA; we found enrichment of GLCTLVAML-specific T cells in synovial fluidtaken from patients with psoriatic arthritis (NR2) and osteoarthritis (NR3;Fig. 2a). We identified five HLA-B8+ patients, three of whomsuffered from RA (RhA4, RhA5, RhA7), one of whom had psoriatic arthritis (NR2)and one of whom had osteoarthritis (NR5). 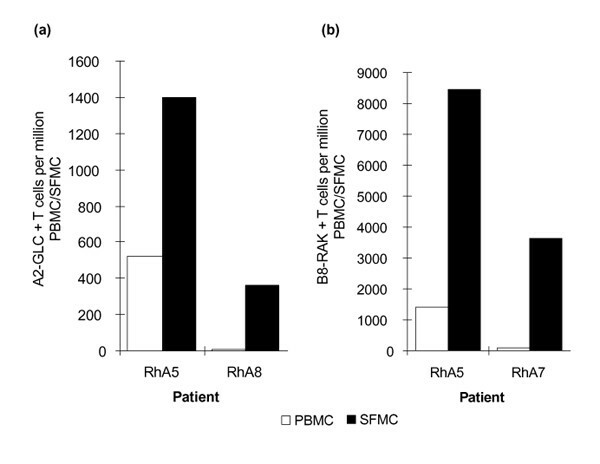 In patient RhA5, 13.1%CD8+ T cells within synovial fluid reacted with the B8-RAKtetrameric complex compared with 4.3% within peripheral blood (Figs1c and 2b). Similarly in patientRhA7, we found that 7.3% of CD8+ T cells were specific for theRAKFKQLL epitope in synovial fluid compared with 0.9% CD8+ T cellswithin the periphery (Figs 1d and 2b). In the third RA patient, as well as in patients withpsoriatic arthritis and osteoarthritis, the frequencies of T cells specific forthe RAKFKQLL epitope were also much higher in synovial fluid than in peripheralblood (Fig. 2b). T cells that were specific for the HLA-B8 restricted epitope(FLRGRAYGL) from the EBV latent protein EBNA3A were either undetectable orpresent at only very low frequencies (<0.1% of CD8+ T cells) inthree of the five HLA-B8+ patients studied. In donor RhA7 we foundFLRGRAYGL-specific T cells at a frequency of 0.5% CD8+ T cells inperipheral blood and 0.4% CD8+ T cells in synovial fluid. In apatient with osteoarthritis (NR4) we found FLRGRAYGL-specific T cells at afrequency of 0.4% in peripheral blood and 0.2% in synovial fluid. Thus, usingthis technique we did not find evidence for enrichment of T cells specific forthis EBV latent epitope within synovial fluid of patients with inflammatoryarthritis. In general the frequencies of EBV-reactive T cells within peripheralblood of the patients studied were similar to those previously reported inhealthy individuals  using this technique, despite theuse of immunosuppressive drugs. In selected individuals we performed ELISpot assays to detectIFN-γ secreted by SFMCs and PBMCs after a short incubation invitro with peptide epitopes from EBV lytic proteins (Fig. 3). We calculated that the estimates of frequency ofvirus-specific T cells obtained with an ELISpot assay for IFN-γ secretionwere a mean of 19.9-fold and 20.1-fold lower than those obtained with tetramerstaining in peripheral blood and synovial fluid, respectively. We havepreviously shown that in healthy control individuals estimates of frequency ofEBV-specific T cells obtained with the ELISpot assay are a mean of 4.4-foldlower than those obtained by staining with tetrameric complexes . Thus, the ability of the virus-specific T cells to secreteIFN-γ appeared to be impaired both in peripheral blood and synovial fluidin the present patient group. The correlation between the numbers of T cellsthat were detected using an ELISpot assay versus tetramer staining wasrelatively poor in this group of patients, suggesting interindividual andintersite differences in the functional capacity of the antigen-specific Tcells. Despite these limitations, the results of the assays showed enrichmentfor T cells that were specific for epitopes from EBV lytic proteins withinsynovial fluid, and showed that subpopulations of these cells are able tosecrete proinflammatory cytokines after short-term stimulation. In light of recent results that suggest increased responses ofsynovial lymphocytes from some RA patients to CMV antigens derived from pp65and IE1 proteins , we also assessed the number ofSFMCs specific for a CMV epitope in a second group of four patients. HLA-A2tetramers carrying a CMV-derived epitope (pp65 NLVPMVATV) were made and used tostain CD8+ synovial fluid lymphocytes from four HLA-A2+RA patients (RA3, RA11, RA14 and RA15). Paired samples of peripheral blood fromthese donors were not available for comparative analysis. The frequency ofA2/NLV-reactive cells varied greatly from one patient to another, but reachedup to 13.9% in one patient (RA15; Table 2). Consistentwith these findings, CD8+ SFMCs from these donors secretedTNF-α after short-term incubation with COS cells transfected with HLA-A2and pp65 complementary DNA (Table 2) . Frequency of IFN-γ secreting antigen-specific T cellsdetected using an ELISpot assay. ELISpot assays to detect IFN-γ secretedby T cells following short-term incubation with (a) the GLCTLVAMLpeptide or (b) the RAKFKQLL peptide were performed on paired samples ofperipheral blood mononuclear cells (PBMCs) and synovial fluid mononuclear cells(SFMCs). The number of spots detected per 106 mononuclear cells isshown. The phenotype of RAKFKQLL-specific T cells in peripheral blood andsynovial fluid from patient RhA7. Samples of peripheral blood mononuclear cells(PBMCs; left column) and synovial fluid mononuclear cells (SFMCs; right column)were stained with anti-CD8, the B8/RAKFKQLL tetramer and with monocloncalantibodies specific for (a) CD38, (b) CD62L, (c) CD45RA,(d) CD45RO, (e) CD57 and (f) CD28. The percentagefrequency of CD8+ tetramer reactive cells that stain with thephenotypic markers are shown; 200000 live cells were included in the analysis.FITC, fluorescein isothiocyanate. Tumour necrosis factor (TNF) response was estimated by titratingthe mononuclear cells after short-term incubation with COS cells transfectedwith human leucocyte antigen (HLA)-A2 and pp65 complementary DNA, as describedby Scotet et al . We used a tetramer of HLA-A2 complexed with the GILGFVFTL epitopefrom influenza A matrix protein to stain paired samples of peripheral blood andsynovial fluid from six HLA-A2 patients, four of whom had RA, one of whom hadosteoarthritis and one of whom had reactive arthritis. Influenza-specificCD8+ T cells were undetectable in both PBMC and SFMC preparations infour donors. The frequencies of the influenza-specific CD8+ T cellsin the other two donors were very low (<0.2%) in peripheral blood and showedno enrichment within synovial fluid. We analyzed expression of cell surface markers of activation anddifferentiation by EBV antigen-specific cells in paired samples of peripheralblood and synovial fluid in donor RhA7 (Figs 4 and5). CD69 and HLA-DR are often upregulated by activatedCD8+ T cells; these molecules were found to be expressed at higherlevels on RAKFKQLL-specific T cells within synovial fluid than in those foundin peripheral blood (Fig. 4). Coexpression of CD69 andHLA-DR represents an unusual phenotype, but one that has been describedpreviously within the joint . CD38 expression hasalso been used to identify activated cells; this molecule was expressed on 56%of RAKFKQLL-specific T cells within the joint, compared with on 15% within theperiphery (Fig. 5a). L-selectin (CD62L) is downregulated after antigen stimulation, withexpression often being regained in the stable memory state . This molecule was expressed on only 5% of theRAKFKQLL-specific synovial fluid lymphocytes, compared with on 23% of the cellswithin peripheral blood (Fig. 5b). CD45RA was not expressed at high levels by significant numbers ofRAKFKQLL-specific cells within synovial fluid, but was expressed by 25% ofthose within peripheral blood (Fig. 5c). 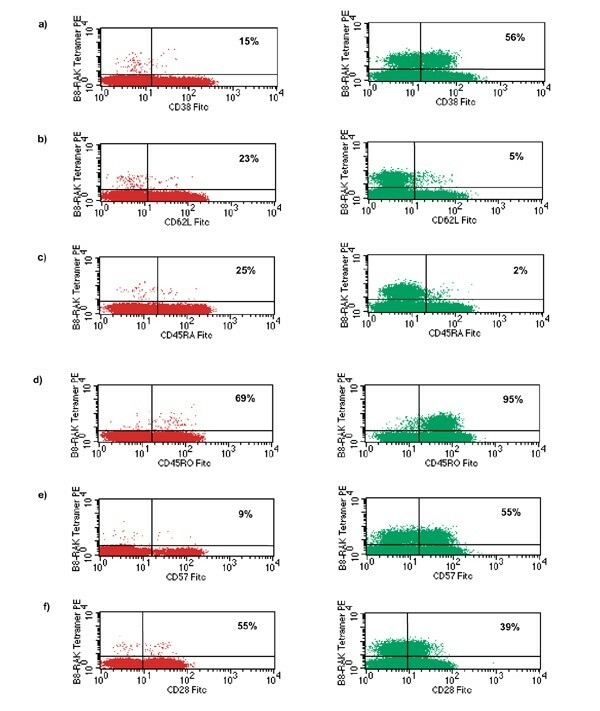 The vastmajority of RAKFKQLL-specific cells within synovial fluid were CD45RO bright;69% of these antigen-specific cells within the periphery expressed CD45RO (Fig. 5d). Expression of CD57, a glycoprotein of unknown function, is thoughtto occur on CD8+ T cells in a late differentiation compartment. This molecule was expressed on 9% ofRAKFKQLL-specific T cells within peripheral blood and on 55% of these cellswithin synovial fluid (Fig. 5e). CD28 is a costimulatory molecule that binds B7; down-regulation ofCD28 expression is associated with a diminished proliferative capacity and mayreflect a state of late-terminal differentiation .This molecule was expressed on 55% of RAKFKQLL-specific T cells withinperipheral blood and on 39% of T cells in synovial fluid (Fig. 5f). Analysis of GLCTLVAML-specific T cells within peripheral blood andsynovial fluid from two further donors, with RA and osteoarthritis,respectively, revealed the same pattern, with EBV-specific T cells within thesynovial fluid showing an increase in markers of activation and latedifferentiation as compared with those in peripheral blood (data notshown). The present study shows that virus-specific CD8+ T cells are enriched in synovial fluid from individuals with inflammatory arthritis. In particular, CD8+ T cells specific for two epitopes from EBV lytic cycle antigens (GLCTLVAML from BMLF1 and RAKFKQLL from BZLF1) may be present at very high frequency within the joints of EBV-seropositive patients. In donor RhA5, staining with tetrameric HLA-peptide complexes showed that T cells specific for these two epitopes accounted for 17.6% of all CD8+ T cells within synovial fluid (over 106 cells in a single joint aspirate). The findings described are not specific for RA and we obtained similar results in a patient with psoriatic arthritis (NR2) and in patients with osteoarthritis (NR3 and NR4). We also found very large numbers of T cells specific for an epitope (NLVPMVATV) from the CMV tegument protein pp65 in one patient with RA, and clearly detectable populations of T cells specific for this epitope in three other patients with RA. We did not find high frequencies of T cells specific for an epitope (FLRGRAYGL) from the EBV latent protein EBNA3A or of T cells specific for an epitope (GILGFVFTL) from the influenza A matrix protein within SFMCs in the patients studied. Thus, the synovial T-cell population is not simply a 'concentrated' pool of peripheral memory T cells. Many factors may contribute to the enrichment of T cells specific for certain viral antigens within the joint; these include preferential migration of subsets of T cells, local stimulation within the joint and protection from apoptotic cell death within the joint. T-cell migration to sites of inflammation is a carefully controlled process [27,28,29] and T cells with an activated and memory phenotype may be preferentially recruited to a site of inflammation. 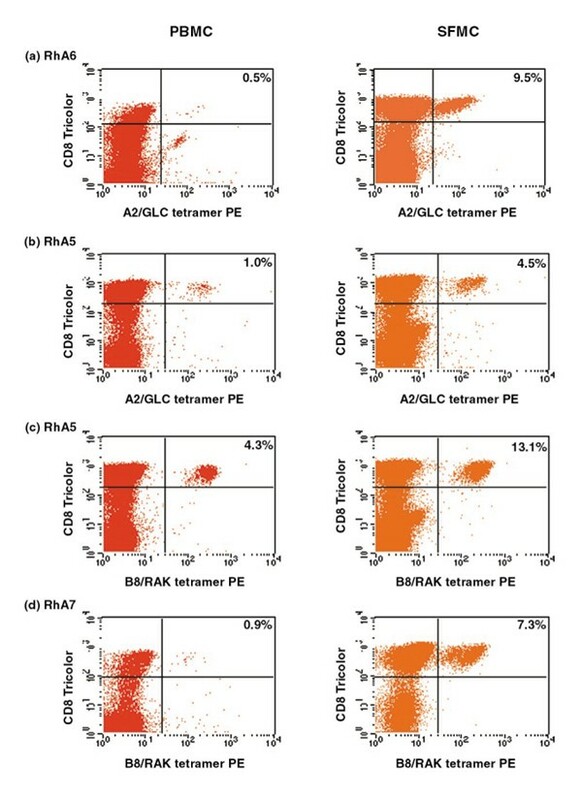 The experiments described here show that the antigen-specific T cells within PBMCs are relatively more common in the CD62Llo, CD45RO+ and CD45RA- compartments than in the CD62Lhi, CD45RO- and CD45RA+ compartments. Thus, selection for activated/memory T cells is likely to account at least partly for the observed enrichment of virus-specific T cells within the joints. Current experiments are aimed at investigating the importance of expression of integrins and chemokine receptors by T cells in the recruitment of virus-specific T cells into joints [27,30,31]. It is also possible that T cells are stimulated to proliferate within the joints. Preliminary experiments (unpublished data) suggest that a small proportion of CD8+ T cells (usually <5%), including some EBV-specific T cells, are in cell cycle within synovial fluid. the stimulus to proliferation might be the relevant viral antigen itself. CMV dna has been detected in rheumatoid synovium . Bcells as well as T cells are recruited into inflamed joints and, in EBV-seropositive individuals, a subpopulation of these Bcells will be latently infected with EBV. One might therefore expect to find this virus within inflamed joints. Although some early studies  found no evidence of EBV infection within joints, other reports [34,35] described detection of EBV DNA within the joints of patients with RA and one study  described the use of in situ hybridization to detect EBV-encoded small RNA1 and LMP1 transcripts in synovial lining cells from RA patients. Furthermore Koide et al  derived a fibroblastoid cell line that expressed EBV proteins from the synovium of a patient with RA. Very recently, Edinger et al  reported detection of EBV DNA within synovia from 10 out of 11 patients with RA. That study also provides evidence of transcription of EBV EBER1 and BZLF1 in samples of synovia from patients with RA and osteoarthritis. Thus, expression of BZLF1 within the joint may be stimulating T cells specific for the HLA-B8 restricted RAKFKQLL epitope from BZLF1. Transcription of BMLF1 has, however, not been detected within synovial tissue, suggesting that alternative mechanisms may be responsible for driving the proliferation of CD8+ T cells specific for the HLA-A2 restricted epitope (GLCTLVAML) from BMLF1. One possible alternative is that antigen-presenting cells such as dendritic cells may take up EBV antigens and subsequently be recruited to joints where they present epitopes from the EBV antigens by 'cross-presentation' . A second possibility is that the virus-specific T cells are being stimulated by cross-reactive self-antigens expressed within the joint. In favour of this is the fact that a subpopulation of T cells specific for the HLA-B8 restricted RAKFKQLL peptide epitope is able to cross-react with a self peptide from a serine-threonine kinase . Relative resistance to apoptotic cell death is a further theoretical factor that could influence the frequency of the virus-specific T cells within the joint. Although there is evidence that T cells within the joint are protected from apoptosis by type 1 IFN  there is no obvious reason to believe that the T cells specific for the RAKFKQLL and GLCTLVAML epitopes should survive more efficiently than other CD8+ T cells. The results of the ELISpot assays for IFN-γ release after incubation of SFMCs with peptide epitopes from EBV and of the assays for TNF-α release after incubation of SFMCs with COS cells transfected with HLA-A2 and CMV pp65 suggest that the T cells within the synovial fluid retain their capacity to secrete proinflammatory cytokines. Within the joint, the secretion of such cytokines could lead to activation of synoviocytes and hence to the maintenance of inflammation . Cell-cell contact between the activated virus-specific T cells within the joint and the synoviocyte population is a second mechanism whereby the virus-specific T cells might interact with the indigenous cells within the joint and contribute to the pathogenesis of inflammatory joint disease . Importantly, these experiments show that large numbers of T cells within the joint are specific for epitopes from certain viral proteins. Many previous studies analyzed T-cell receptor use of T cells within the joint and found evidence of clonality, and concluded that the T cells are being driven by a specific self-antigen. Paliard et al  found that clonality was particularly marked within Vβ 14+ T cells within synovial fluid and that Vβ 14+ T cells were not well represented within peripheral blood of patients with RA. Those authors suggested that a superantigen might have caused activation of Vβ 14+ T cells, with recruitment of selected Vβ 14+ T cell clones into the joint followed by deletion of Vβ 14+ T cells in the periphery. It will be interesting to analyze Vβ usage of our HLA-viral peptide tetramer-reactive CD8+ T cells. From the work we have described, it seems likely that at least some of the clonally expanded populations of CD8+ T cells found in synovial fluid are specific for viral antigens. The reasons for the presence of large numbers of synovial T cells specific for certain viral epitopes and not others remain unclear, and the role that these virus-specific 'bystander' T cells may play in the maintenance of inflammation needs further investigation.